Gil Hodges was one of the legendary members of the Brooklyn and Los Angeles Dodgers teams that captured two World Series titles. He also famously added a third World Series crown as the manager of the 1969 Miracle Mets. 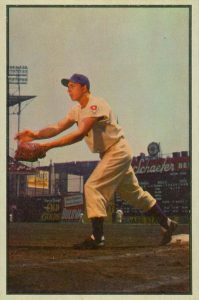 This list collects some of the best Gil Hodges card appearances from his playing career and beyond. In addition to being one of the top sluggers from the 1950s, Hodges was also one of the best defensive first basemen in the National League as he won three consecutive Gold Gloves from 1957 to 1959. A very consistent hitter, Gil had nine seasons with 25+ home runs and seven seasons with over 100 RBI. After his retirement, Hodges managed the Washington Senators and New York Mets. Most notably, he helped take the Mets from the bottom of the league in 1968 to the World Series in 1969. 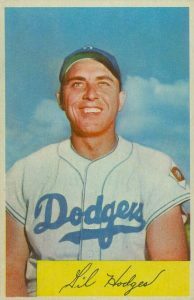 Shop for Professionally Graded Gil Hodges cards on eBay. 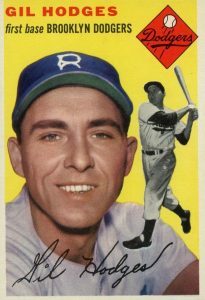 While Hodges was a mainstay in the Bowman and Topps sets, he did appear in some lesser sets in the 1950s and '60s. This includes two tiny sets from meat products in 1954 Wilson Franks and the 1954 and 1955 Stahl-Meyers Franks sets. After Hodges joined the Mets, he was featured with longtime Dodgers teammate Duke Snider on a combination card entitled "Friendly Foes" from 1963 Topps. Another choice is the 1961 Nu-Cards Scoops set which features a robust checklist of cards with mock newspaper headlines. The Hodges card pays homage to his four-homer game in 1950. As a result of Hodges' sudden death in 1972, autograph collectors must track down signed baseballs or in-person autographs obtained by fans during his playing and coaching days. A few modern sets have included bat and jersey relic of Hodges including 2016 Panini Immaculate Collection, which features a combination relic with Pee Wee Reese. In 2016 Panini Diamond Kings, fans can find a bat relic card for Hodges and 2013 Panini Golden Age features New York Mets jersey relic cards. Despite all his accolades, Gil Hodges has not been awarded a place in Cooperstown. Hodges' absence from the Baseball Hall of Fame is often cited as one of the sport's biggest travesties. No matter which side of the debate you come down on, most collectors can still agree that his baseball card career is remarkable. In determining placement, the card's value and design, as well as the set's importance and availability, was taken into account. We begin the list with a Hodges card from his coaching days that is found in 1970 Topps. As the reverse side of the card details, Hodges managed the Mets from a 73-89 record in 1968 to 100-62 in 1969. The amazing turnaround was complete when the Mets miraculously beat the Baltimore Orioles in the '69 World Series. 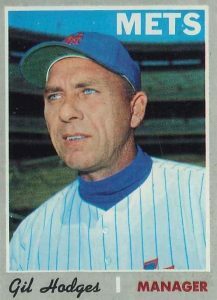 Collectors can find Hodges' managerial cards for the Mets in the Topps sets from 1968 through 1972. Pre-dating his coaching career, his history with the Mets actually began during their 1961 expansion draft when they selected him from the Dodgers roster. 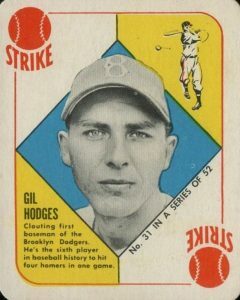 Hodges returned to Topps in the 1954 set after not appearing in 1953 Topps. Because Hodges had a long coaching career immediately following his playing career, Hodges is included in each Topps set, with the exception of 1953 Topps, from 1951 to 1972. Hodges was even traded as a player by the Mets to the Washington Senators for the express purpose of becoming their manager and never missed a beat. 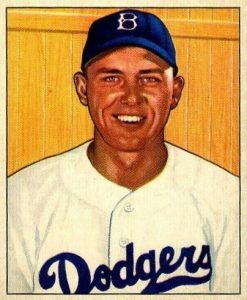 The Gil Hodges card in 1954 Bowman is my personal favorite as he has a broad smile framed in front of a beautiful blue sky. Several Dodgers players in the '54 Bowman set feature that sky which blends so nicely with the uniforms of the Boys in Blue. Hodges' card also features a statistical variation regarding his fielding percentage for the 1953 season. The error version has his fielding percentage as .992 instead of .993, and is slightly more valuable. 1952 Bowman was the card maker's final season using colorized photographs and also the last to feature smaller cards as the size established by 1952 Topps became the new standard. Hodges had one of his best career seasons in 1951 with 40 home runs and 103 RBI. Ultimately, Hodges ended his career with 370 home runs. At the time of his retirement, this was the National League record for right-handed batters. 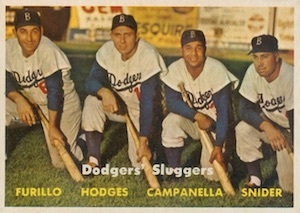 Fans of combination cards should hold the 1957 Topps "Dodgers Sluggers" card in high regard as it includes three all-time Dodgers legends with Hodges, Duke Snider, and Roy Campanella. The fourth player, Carl Furillo, is no slouch either as he was a Dodgers outfielder for 15 seasons and was the National League batting champ in 1953. The first Topps baseball card set from 1951 was divided into Blue Backs and Red Backs. The checklists for both sets feature 52 cards, just like a pack of playing cards. Each card also features a baseball play, such as a foul ball, bunt, or stolen base, and collectors who pieced together the entire set could play a simulated baseball game. Hodges was included in the Red Backs set and his card displays the "strike" action. The 1953 Bowman set featured the first color photographs used in a baseball card set and Hodges is shown waiting to receive a throw at first base. The photograph was clearly taken at the Brooklyn Dodgers' home stadium of Ebbets Field as you can see the famous Schaefer Beer sign that sat on top of the scoreboard there. When a Dodger would get a hit, the "h" in Schaefer would light up and an "e" would light up for an error. Ebbets Field was the Dodgers home from 1913 to 1957, when the team moved to Los Angeles. Alert collectors will notice that Bowman used the same Hodges painting in both 1950 Bowman and 1951 Bowman. The key difference between the two cards is the overall dimensions. The 1950 Bowman card featured below is nearly square at 2-1/16" x 2-1/2" while the 1951 Bowman card is the same width but much taller at 3-1/8" high. 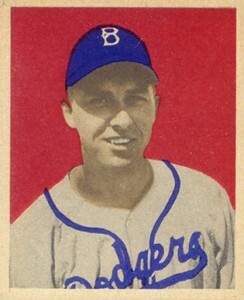 The card back highlights the fact that Hodges initially played catcher for the Dodgers during his first full season, but was replaced by an up-and-coming prospect named Roy Campanella. In 1952 Topps, Hodges' card shows the slugger holding his bat and it's one of the few cards in the set with a horizontal orientation. His card (#36) is situated right next to teammate Duke Snider at card #37 on the checklist. The first 80 cards of the '52 Topps set have a color variation on the reverse side and collectors can find backs with red printing and black printing. Given that the red was the standard throughout the rest of the set, collectors put a premium on the black. Hodges debuted with the Dodgers for a single game in 1943, then lost the 1944 and 1945 seasons to his service in World War II. 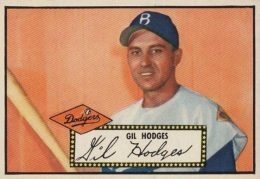 At the end of the war, Hodges returned to the Dodgers' farm system and would make it back to the majors full-time in 1948. 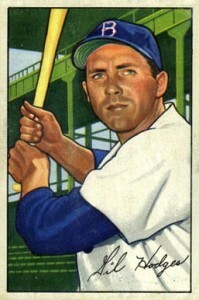 Bowman included Hodges in their 1949 set, which was their second set overall and their first use of color in the printing. The Gil Hodges rookie card doesn't include the front nameplate as Bowman only added these to cards #109 to #240. At auction, near-mint/mint graded copies can reach $500. 1952 TOPPS #36 GIL HODGES BROOKLYN DODGERS VINTAGE CARD ! ! ! THANK YOU for posting this. Glad to see Gil get some love in this way. I have been a huge Hodges fan since my teens and I highly encourage everyone to read up on him…great man both on and off the field and yes….his lack of inclusion in the HOF is a travesty! Good list, although I believe the 1954 Dan Dee Potato Chip card should have made the list as they are rare and every hard to find above VG-EX. Also his 1967 Senators manager card is in my opinion the best looking card. But with that said, I am not sure which two I would remove from the list…. Thanks again! 1952 Coca-Cola Coke Playing Tips #3 Gil Hodges SGC 70 EX+ 5.5 TOUGH!